Salvia Divinorum is a powerful hallucinogen first discovered by Jean Wasson while on an anthropological trip to the High Sierra Madres Mountain Range. Wasson had been searching for mushrooms when he witnessed the Mazatec Indians brewing a tea from the leaves of the salvia plant, peaking his curiosity. The Mazatec Indians had been employing the main compound, salvinorin-a, into their visionary and healing rituals for generations. The Mazatecs discovered something far more potent than the mushrooms he was researching. Wasson brought back samples to the United States and began to propagate them under the popular strain name, Hoffman-Wasson. Read on to learn how to smoke salvia divinorum and experience salvia for yourself. The main compound in salvia, salvinorin-a, is known to be the most powerful, naturally occurring hallucinogen on the planet. When smoking salvia divinorum, the main compound, Salvinorin-a, increases deep meditative states and often facilitates greater levels of consciousness. For this reason, many people have reported to smoke salvia for enhancing OBE’s (out of body experiences) and aiding in astral travel. Smoking Salvia can be used in spiritual vision quests or in healing rituals. It is best taken in a quiet, nearly dark room; either alone, or with one or two good friends present. It should be taken either in silence or with soft music playing. Some people describe visiting the astral plane, communicating with beings from other worlds, and experiencing the complete dissolution of the ego. It is common to completely forget that you smoked salvia within moments of exhaling, becoming a part of your new world as if you had always been there. Salvia is not meant to be used at parties or social gatherings with friends the way alcohol or cannabis can be. If you try smoking Salvia as a party favor, you will most likely end up having a terrible time. The onset of a Salvia divinorum trip usually occurs immediately after inhaling two or three lungfuls of smoke. Most people experience acute effects lasting anywhere from five to fifteen minutes. While hallucinating from salvia; however, time can become radically distorted. While you may be tripping for ten minutes, it is likely that during those ten minutes you will completely lose your sense of time. The secondary effects of Salvia divinorum can last several hours after use. These after-effects can include a sense of calm or a slight lack of coordination and reaction time. The challenge with smoking salvia is that the active ingredient, salvinorin A, is fairly difficult to vaporize. 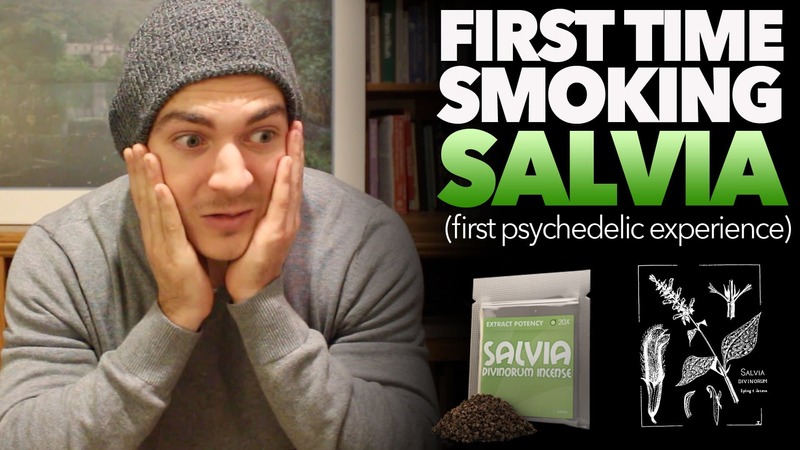 With improper technique, it is possible to smoke salvia leaves without ingesting a high enough dose of salvinorin-a to gain desired effects. A water bong is essential, and it is the easiest way for you to smoke salvia extract. Smoking through a bong cools and condenses the smoke, and then uses air pressure to force the smoke into the lungs. This makes it easier to ingest a large dose of salvinorin-a. A butane lighter is required to maximize the amount of heat you apply onto your salvia extract. Salvinorin-A requires a certain degree of heat in order to fully release and for the compound to enter your blood stream. (1) Use a water-cooled smoking device (a water pipe, or bong). Because the smoke is cooled, it can be inhaled more comfortably without coughing. (3) Try to inhale the full dose in three big inhalations. Each one should be inhaled slowly and deeply, then held for 20 – 30 seconds before exhaling. It is very important to retain each inhalation of smoke deeply in the lungs long enough for it to be absorbed efficiently. Do not pause between exhaling and taking the next inhalation (except for a short breath of fresh air if necessary). This insures that the whole dose will be consumed within the 2 – 3 minute period required. If the dose is smoked too slowly, the Salvinorin-A will be metabolized faster than it is ingested. (5) Use a torch-flame lighter. Many people report better results when using this type of lighter. These produce a very hot torch-like flame that causes rapid combustion of the smoking material and hence produces more concentrated smoke. (6) Use extract-enhanced leaves (fortified leaves). Most people prefer to smoke fortified leaves. These products are concentrated so that the entire dose can be more easily consumed. Some of these products are so refined and concentrated that a full dose produces no more than a tiny wisp of smoke. These products also have a health advantage, since they reduce the amount of smoke that must be ingested to achieve the desired level of effects. One must keep in mind that fortified leaves must be used more carefully because of their greater potency. These products do not need to be smoked in a water-cooled pipe. A torch-flame lighter offers no particular advantage when smoking extract-enhanced leaves because the volume of leaf required can be ignited with sufficient rapidity using an ordinary lighter, or even a match. You can make crude extract enhanced leaves yourself quite easily. Instructions are available in section XIII of the Salvia divinorum FAQ. You may also want to consider one of my standardized salvinorin A enhanced leaf products. Smoking salvia in the presence of a sitter is generally a wise decision. This person must be someone you trust. They will be responsible for keeping you safe as you disconnect from normal waking reality. At the same time, their presence may influence your experience. It is important that this person adds to the calm, well-intentioned atmosphere of your setting. Choosing a safe setting to trip in is as important as finding a qualified sitter. Many people prefer to smoke salvia in a secluded natural setting, or in a home where they feel completely at ease. The sitter is there to reassure you. In case the experience does not go well the sitter is an important part of being able to help you calm down. Providing reassuring words to the person and using simple words such as “You’re safe, I won’t let anything harm you.” “You’re just having a Salvia experience, you’ll feel better in a few minutes.” “Your name is………,” or, “I’m your friend ……..” are helpful sometimes in helping either calm down or remain focused on the experience. Speech is not always helpful, so remaining silent is also important. Tones of how you say words can be perceived as threats so silence is often better route to take. Finally, the sitter is there to help you remember the details of the experience, albeit only the physical part of it. The purpose of someone re-calling particular physical actions may help you jog your memory and be able to recall specific instances in your vision. The sitter could also if you are still aware of your surroundings, or they could talk to you during the experience in a low voice asking you “what are you experiencing now?” Carefully taking notes of anything you say. Make sure your sitter and you discuss whether or not speaking should be allowed since most people who use Salvia prefer silence. NEVER DRIVE WHEN SMOKING SALVIA. Pick the right time and place for a salvia experience. Take your time, this is an important spiritual experience. Privacy and safety are essential. Be very careful about heights, and open flames such as candles. Do not smoke Salvia when you may be interrupted by phone calls, visits, pets, children, etc. Turn off your telephone and set your answering machine to silently record incoming calls. Give careful thought to how much you will take, and how you take it. After all smoking material is safely out, lie down in bed, on a couch, or on a carpet. You are much safer lying down than you would be stumbling around. Stay put for the rest of the experience. The visionary effects are best perceived with eyes closed. Have a sitter. This is especially important if you are new to Salvia, taking a high dose, smoking a strong extract, or using a very strong delivery system (such as vaporization). Volunteer to be a sitter for others. If you have mental health problems, don’t smoke Salvia without first discussing it with your therapist, or doctor. Practice and encourage responsible use. Don’t give Salvia to minors, or to violent or unstable people. Don’t share it with strangers. Know who you are giving it to and know why they want to use it. Never take Salvia while at work or in public. Keep it private. It’s not for concerts. It is not for raves. It’s not for large noisy parties. Better to use it in a quiet and private place in the company of a close friend. Mixing Salvia with other drugs, or large amounts of alcohol may cause out-of-control behavior, or terrifying experiences. While experienced Salvia users have experimented with combinations, these are not for Salvia beginners, and are certainly riskier than just using Salvia by itself. While there are no known toxic drug-drug interactions between Salvia and anything else, this has not been studied scientifically. Be extra careful of flames (candles, lighters, fire, etc.) when using Salvia. Be very careful about using vaporized extracts, vaporized leaves, or smoking high-potency extract-enhanced leaves. These require a sitter to be present. Chewing quid or smoking leaves is much less likely to produce out-of-control behavior than these are. Never use pure salvinorin A unless the dose you are taking has been weighed with an ultra-accurate balance that can weigh out doses in micrograms, and you know exactly how much you can safely take. Even if you do meet these requirements, you still should have a sitter present. If you have read this far, you have managed to learn enough to begin your journey. Whether you now decide, or not, is entirely up to you. If you do, remember to keep an open mind and allow Salvia to guide you in its own way. Salvia was put on this earth for a reason, and that was to guide mankind in its quest for higher understanding. Salvia is recognized as a safe and non-addictive herb, which has prevented most legislative bodies from passing regulations. In addition, salvia is relatively new to western culture, so it is largely under the radar of most governments. It is very likely that you will be free from legal consequences if you use salvia safely and responsibly. Even in jurisdictions where Salvia divinorum use is legal, it is a good idea to avoid attracting attention to or publicizing your use of salvia. Click here to see if salvia is legal where you live. Disclaimer: None of the descriptions given on this site have been evaluated by the Food and Drug Administration (FDA). The methods of use for Salvia Divinorum and Salvorin A discussed on this site are not meant to diagnose, heal, cure, relieve or prevent any illnesses. All information on this site are the views of the individual writers who do not declare to be medical experts giving pharmaceutical advice. This site is strictly with the mission of providing views of the author.